Wirt Design Group has designed the new law offices of Akerman LLP located in Los Angeles, California. When relocating their Los Angeles regional office, Akerman LLP sought to create an atypical law office that would equally match their atypical firm. This meant departing from the traditional, conservative environment they were in to a one-of-a-kind, amenity-rich space capable of supporting their innovative practice. Our design centered around Cal Edison Building’s unique historic character and married it with modern design elements. This aesthetic, merging the old with the new, speaks to Akerman’s image as a well-established, but forward-thinking brand. To accomplish this, designers exposed the concrete deck, exterior walls, flooring and columns. Revealing the waffle slab ceiling and hand-painted column numbers exposes the building’s history and creates texture and interest. Designers played with geometries of architectural elements against the grid of the ceiling. Glass, natural stone, glossy ceramic tile, pops of red and modern artwork, furnishings, and lighting contrast with the rawness of the exposed antique structure. Carpet and wood paneling add a sense of warmth to the minimalist space. The program required a large open space for entertaining, a 36-person board room and an assortment of meeting spaces in various sizes. Just past reception is a large open lounge, surrounded by a boardroom, two meeting rooms and breakroom. 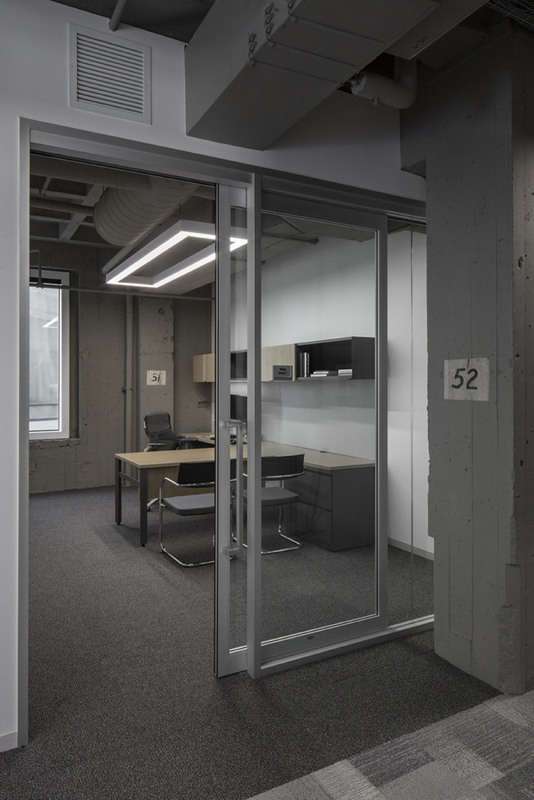 Movable glass partitions were utilized at each of the meeting rooms, which when opened create one large space for entertaining. The adjacent patio is an extension of the entertainment space and sees regular use by attorneys when needing to step away from their desks to recharge. The resulting office is bright, open, comfortable, progressive and directly aligns with Akerman’s brand. The new office establishes a modern image for the firm in the LA market. The client credits the space for helping them meet their business objectives and retain and recruit talent.